January is a great month in the School Greenhouse for Cymbidium species (see Cymbidium erythraeum – day 369) with great diversity in colour and form. 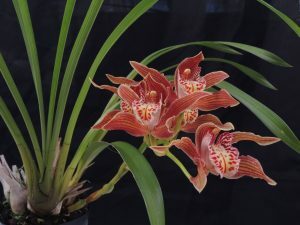 Cymbidium iridiodes is remarkable for its large flowers with rich red stripes and spots. The flower stems are rather thin and resulting in a semi-pendulous spike habit which is great as it keeps the flowers well clear of the leaves but does require us to spot the spikes as they emerge and raise plants (we balance them on crates) to show them off to their best.